The Samsung Galaxy J7 (called the Sky Pro) is the big brother to the Samsung Galaxy J3 Sky and the Galaxy J3 Luna Pro which have both been available from Tracfone for several months now. 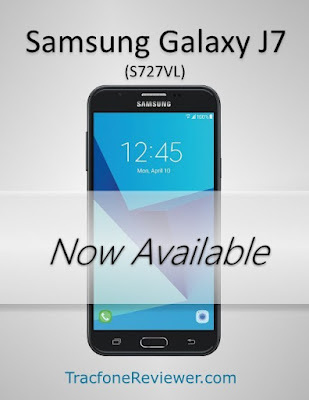 Update: There is a new version available, the Samsung Galaxy J7 Crown, with updated features including newer Android OS and faster processor. Follow the link above to view more details. The Galaxy J7 Sky Pro has a large, 5.5" touchscreen, quad-core processor, 2 GB RAM and 16 GB internal memory. It also comes with Android 6.0.1 and an 8 MP camera. One of a handful of popular phones released by Tracfone in 2017, the Galaxy Sky Pro is one of only a few phones that comes with 2 GB RAM. Tracfone has continued to release new phones with 2 GB RAM and 16 GB memory, with the LG Fiesta 2 and LG Rebel 3 some of the more recent options. 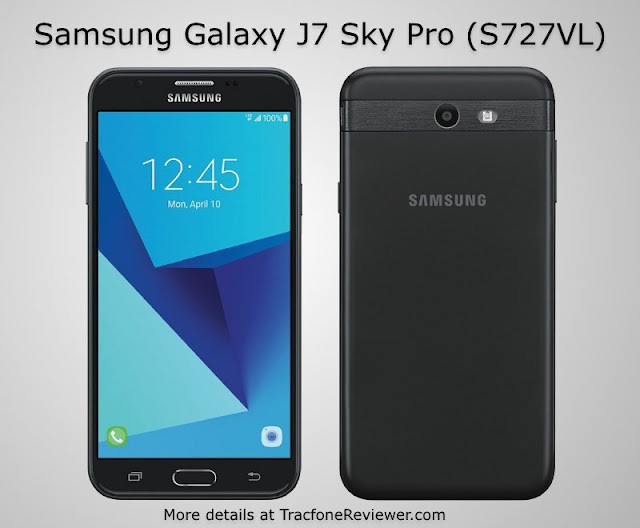 Many Tracfone users have been looking for a phone from Tracfone that can offer performance at an affordable price, will the Galaxy J7 meet that need? Let's take a closer look to learn more. Size: 3.09" x 6.0" x 0.30"
The Galaxy J7 brings improvements in several areas over its predecessors, the Galaxy Sky and Galaxy Luna, most notably increased RAM, screen size and processor. It has a few similarities to the Galaxy Luna Pro, such as Processor, RAM, and internal memory. We will share more comparison details further down, but first let's look at a breakdown review of each of the main components on the J7. At 5.5", the screen on the Samsung Galaxy J7 is large enough to make watching videos and texting easy, but not so big it won't fit in a pocket. It is a very popular size for many smartphones these days, with a several other phones, such as the LG Fiesta 2, also featuring a 5.5" screen. It has an HD screen with resolution of 720x1280 (266 dpi), and most users find it vibrant and easy to see. There are options to make it brighter for outdoor use, and to dim it when using it at night. Overall it is one of the better screens for a phone in this price range from Tracfone. The Galaxy Sky Pro comes with 2 GB RAM, 16 GB internal memory and a quad-core 1.4 Ghz processor (Snapdragon 425) that pair well together to allow multitasking and good responsiveness. The operating system and pre-installed apps take up about 8 GB, leaving 8 GB free for adding apps, pictures, music and videos. There is also a Micro SD Card slot for additional storage. Although many would prefer this phone with extra storage space, such as 32 GB , it is quite capable of everyday use and loading a good number of apps on it before running out of space. Check out our list of the Best Apps for Android for some ideas. The camera performs well for both video and photos, and is capable of 1080p HD videos and 8 MP images. The front selfie camera shoots 5 MP pictures and has a 'wide angle' mode to allow more people to fit into one shot. Battery life for the J7 Sky Pro is very reasonable, with 3300 mAh that should easily last the day for most users. It does have a battery saving mode to help reduce power usage when running low. Screen brightness and processor speed are usually the largest power consumers on a device, so if you find yourself running out the battery quickly, consider reducing these, or invest in an external battery pack. The Galaxy J7 Sky Pro uses Android 6.0.1 which was first released at the end of 2015, and comes with a number of improvements, enhancements and appearance changes over previews versions. One issue with Tracfone smartphones is that you cannot update the OS. So whatever the version the phone comes with, it will not update to any newer versions. For most people, this isn't a problem, but if you like using the latest and greatest Android OS, consider looking into an unlocked phone like the Moto G5 Plus, and bringing it to Tracfone BYOP. The combination of features and specs on the Galaxy J7 are impressive, especially at the price it can be found for online, and it is no wonder it has been a popular choice for many users. How does the Galaxy J7 compare to some of the other recently released smartphones? Let's take a look. The Galaxy Luna has a 4.5" screen, while the Galaxy Sky comes with a 5" screen. Both of these devices have been popular choices for their good performance, and reasonable price, and both the Galaxy Luna Pro (5" screen) and Galaxy Sky Pro (5.5" screen) step it up another level with the increased RAM, Storage and screen size. The main difference between the Galaxy J3 Luna Pro and Galaxy J7 Sky Pro are the screen size, and improved RAM on the J7. The Galaxy J7 runs Android 6.0.1 which is a fairly recent version of the OS, but the LG Fiesta 2 and LG Rebel 3 already come with Android 7.0. The Fiesta also has a 5.5" screen, and 16 GB storage/2 GB RAM. The LG Rebel 3 has a smaller 5" screen, and the same RAM/Storage. With the great performance of the Galaxy J7 Sky Pro, we have added it to our List of the Top 5 Tracfone Cell Phones. Verizon will also be getting their own version of the Samsung Galaxy J7, which may have different specs than the Tracfone version. And it may be possible to bring it to the Tracfone BYOP program at a cheaper cost. The Samsung Galaxy Sky Pro is currently available from Amazon and QVC.com for $99 with airtime bundle (1500 talk, text, data and 1 year service) which is a great deal. The airtime is worth about $125, making the phone free! We expect the price to go up slightly in the near future. Overall the Galaxy J7 Sky Pro is very similar to the Galaxy Sky and Galaxy Luna, but with a larger screen and improved processor and RAM to keep up. If you are looking for a phone with a large screen the Galaxy Sky Pro might be a great option. View the online tutorial for the J7 Sky Pro to learn more and here is the user manual. Let us know if you have questions or thoughts by sharing a comment below. We will continue to update this as more information becomes available. Keep up with the latest news and posts by following us on Facebook. If you're new to Tracfone, get started with our Beginners Guide to Tracfone which includes a lot of helpful information. And also take a look at our recent list of Tracfone Deals and Discounts for some great bargains. Airtime Comparison - Which Tracfone Card Should you Buy? Welcome to TracfoneReviewer, a blog about all things Tracfone related! Is it cheaper to buy the 60 minute card every three months or the 1 Year Card? What is the cheapest way to buy service days? We hear these questions, and more, quite often, and wanted to share the answers to these questions, as well as others, with our readers. Further on we also compare all of Tracfone's airtime cards to better understand which ones offer the best value. With Tracfone airtime cards, there isn't a 'best' card for everyone, because it all depends on how much airtime you use, and if you use your data and texts often. So we have included several common scenarios, with the best airtime card for that situation. Go to the Tracfone website, under regular airtime cards add the 30 minute (online only) card for $9.99 to your cart.Proceed to next page, where you should be offered several add-ons including 365 service days for $50. Add that to your cart and checkout. The cheapest way to add texts to your phone is to buy the 1000 text card for $5. This card is only available for smartphones. The cheapest way to add data to your smartphone is to buy the 1000 MB card for $10. The best deal for adding both texts and data is to add the 300 minute, $20 smartphone card which gives you 1000 texts, 1000 MB data, 30 service days and 300 minutes. This breaks down to essentially receiving the 300 minutes for less than $1 which is a fantastic deal. If you don't need service days or talk minutes, just add the text and data only cards. If you want more talk time, consider the 750 minute $35 card which also gives 1000 texts and 1000 MB. Tracfone doesn't offer a talk card like their text and data cards. So if you only need talk minutes, you have to purchase a card that includes texts and data as well. The 500 Minute card ($25) and 750 Minute Card ($35) are both good options, where you get a good number of talk minutes along with texts, data and 60 service days. If you find that you only use talk minutes, you probably want to avoid switching to a Tracfone smartphone. Stick with a regular cell phone where all the airtime goes into a single pool. In this case, the 450 minute card is the best value for non-smartphones. The best airtime card to buy is the one that fits with the amount of minutes you use. Some cards are a better value than others, but if you're not using the airtime anyway, it doesn't really matter. Of course, airtime never expires, as long as you still have service days. The 500 Minute ($25), 750 Minute ($35) and 750 Minute ($50) smartphone only cards are all less than $20 a month, and give the best value on talk, text and data minutes. With Tracfone, you get to monitor what you use, and purchase the airtime you need. Airtime usage may change from month to month, allowing users to purchase a different airtime card depending on the need. If you prefer not to worry about purchasing more airtime every few months, Tracfone's auto refill might be a good option. We have already created a Guide to Tracfone auto refill which includes a look at the best value. Many of our longtime readers will know that we've already compared Tracfone's airtime cards in this post. But we wanted to create a more simplified article, and also include several new airtime cards, such as the $20 Smartphone card Tracfone recently added. This comparison will look more closely at how much each airtime card really costs so that our readers can see which one might be the best deal for them, and also to back up the information we provided above. This table includes Tracfone's regular and smartphone only airtime cards with the talk, text and data amounts on the left side, and how much each talk/text/data minute costs. On the far right we have also color coded which cards are 'better' or 'worse' deals with green for good, yellow is ok, and red is bad. Notice that the smartphone only cards are generally a better deal, this is because they offer more data and texts compared to the regular airtime cards. The new 300 minute smartphone only card (for $20) is the best value for airtime. If you subtract the cost for texts (1000 texts equals $5) and data (1000 MB data equals $10) and service days (30 service days equals $4.17) then you get 300 minutes for just $0.83. That is about 1/4th of a penny per talk minute. However, you are getting a lot of airtime and only 30 service days, so if you don't use that much airtime, it is probably best to use a card that offers more service days. This next graph illustrates this for each Tracfone airtime card. The graph above shows how many talk minutes you get per dollar once other variables are removed. We factored out the cost for texts, data and service days, and then divided the number of talk minutes you receive by the remaining cost. As you can see, most of the airtime cards are somewhat close together, but the 300 minute smartphone only card is a winner when it comes to value. We hope this information is helpful, and please leave a comment with any thoughts or questions. Be sure to also follow us on Facebook with a growing community of Tracfone users. If you're still new to Tracfone, consider our Beginners Guide to Tracfone which will share a variety of information to get you started. Make your airtime stretch even further and use a Tracfone with Triple Minutes for Life. We have lots of other info to share, including cell phone reviews, Tracfone promo codes and more. The latest promo codes gathered and shared here for the TracfoneReviewer readers. 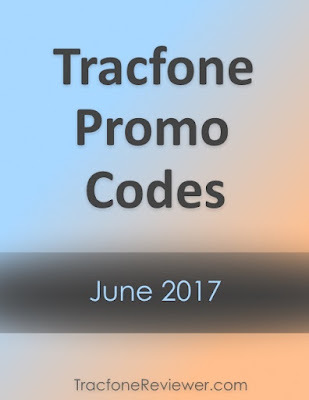 As summer arrives so does a fresh batch of promo codes to use with Tracfone. We collect these codes and share only the latest here in this promo code list. We also have a larger list of codes on our main promo code page. Use these codes when adding an airtime card to your Tracfone device. Each code is for a specific airtime card, but usually can be used with cards of greater value (for example, a code for the 60 minute card can also be used with the 120, 200 and 450 minute cards). Some promo codes can only be used once, while others can be used multiple times. These promo codes may also work on Tracfone smartphones like the LG Fiesta and Samsung Galaxy Sky, as well as BYOP devices like the Moto G5 Plus. Initially Tracfone appeared to not allow smartphones to accept promo codes, but a number of readers have confirmed promo codes adding bonus talk airtime on their smartphone devices. Tracfone is now offering bonus airtime on Smartphone Only airtime cards. Below is the only code available at this time, which gives bonus data for the $25 smartphone card. If you're considering a new phone, start with our Cell Phone Reviews page or have a look at our recent list of the Best Phones for Tracfone BYOP. 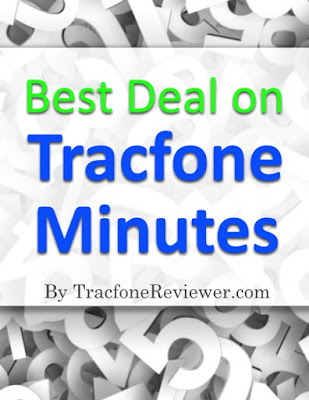 With recent changes to the Tracfone website, it appears that the best way to ensure you receive bonus minutes is to call Tracfone directly and add airtime over the phone where you should have the chance to try more than one promo code. 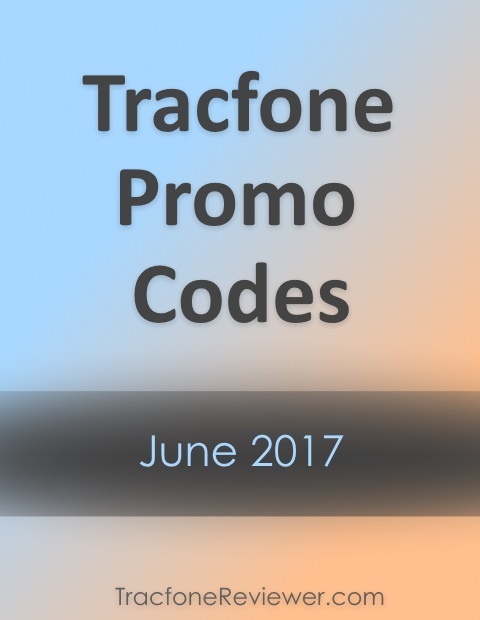 These are the latest Tracfone promo codes for June 2017. Let us know in the comments which code you used, and how it worked for you! Looking for helpful information on how Tracfone service works? Look no further than our recently updated Beginners Guide to Tracfone which shares the basics of Tracfone airtime, phones and much more. Visit our post on Unlocking Your Tracfone Device which shares how you can check if your phone is unlock-able, and details the steps to do it. Also check out our latest Deals and Discounts including both Tracfone smartphone and unlocked devices. Follow us on Facebook for the latest news and information, and connect with our helpful community.